After this brief breath taking stop we continued. We reached a toll gate run by Engaraku Council where we each paid $5 to continue. Of course, this was the point where the road got really bad – at times we seemed to be driving across ploughed fields rather than on a road. Of course, that would explain the stone throwing children. 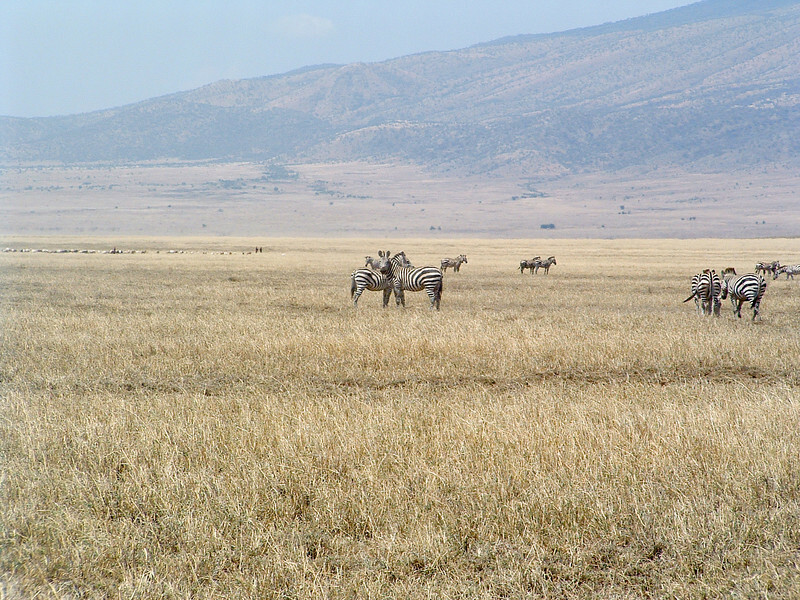 We saw a number of the creatures that roam the rift valley, Lesser Zebra as pictured here, Thomson’s Gazelles lots of birds. The escarpment still dominated the landscape for a few hours. We stopped to eat our lunch under an Acacia tree, stealing its shade from a small group of gazelles. Isaac made sure there were no lions about before we left the vehicle. Under the tree was a large amount of droppings – the animals pay the tree well for the relief it provides from the sun. “Ah, one of those gazelles was in oestrus.” exclaimed Isaac, pointing down at some spots of blood on the floor as we tucked into the sausage we had each been provided by Mtui.